I don't want to jinx anything since we just had a bunch of snow last week, but it looks like spring might be here. Even if it's just a preview, I'll take it. I always get so pumped every time the season starts to change, and having more daylight at the end of the day has been wonderful so far. Gimme all the sun rays and evening walks. I have quite the ever-growing collection of Stay Home Club shirts these days. It's been so cool watching this company grow. Remember this post? October 2012-- man, that feels like a lifetime ago. I love watching handmade businesses flourish. Well, it's time for me to get my fingers to work. Happy Wednesday, friends! It's been feeling like spring this week in Ottawa (Canada) too and I'm so excited! It's supposed to get cold again tomorrow but then they're saying next week will be lovely again. At the same time, I don't want to get my hopes up as it's been known to snow here on Mother's Day. I love Stay Home Club wear - and you always rock it! Love the tee! Cute look! I really love the Stay Home Club tshirts and sweaters, but I'm yet to find an accessible UK stockist... still dreaming! 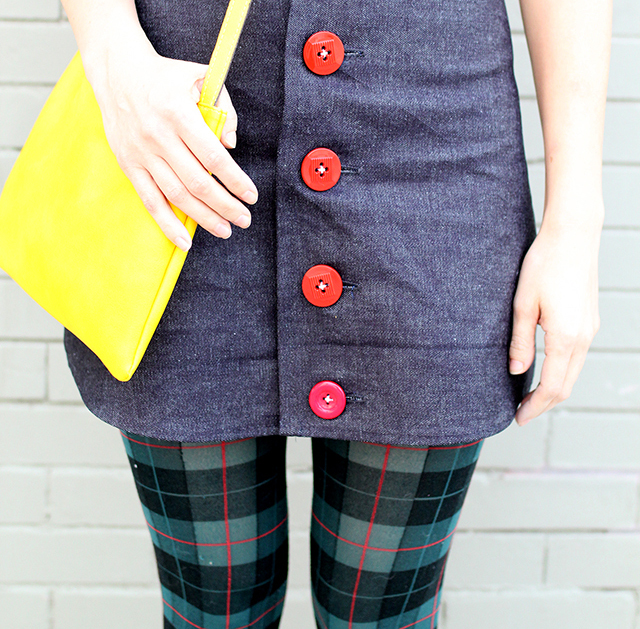 My favorite part of this outfit is the skirt and it's red buttons, so yay on making it yourself! 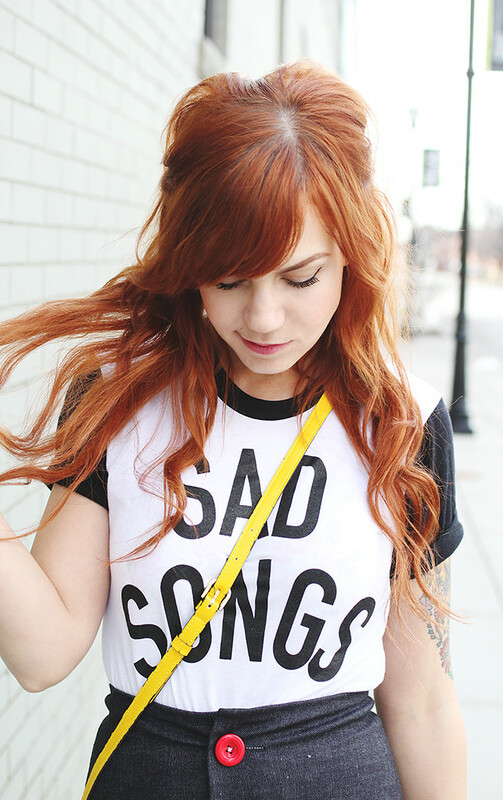 Love the stay home club designs, their 'the worst' tee is on my wishlist for definite! I love your skirt! 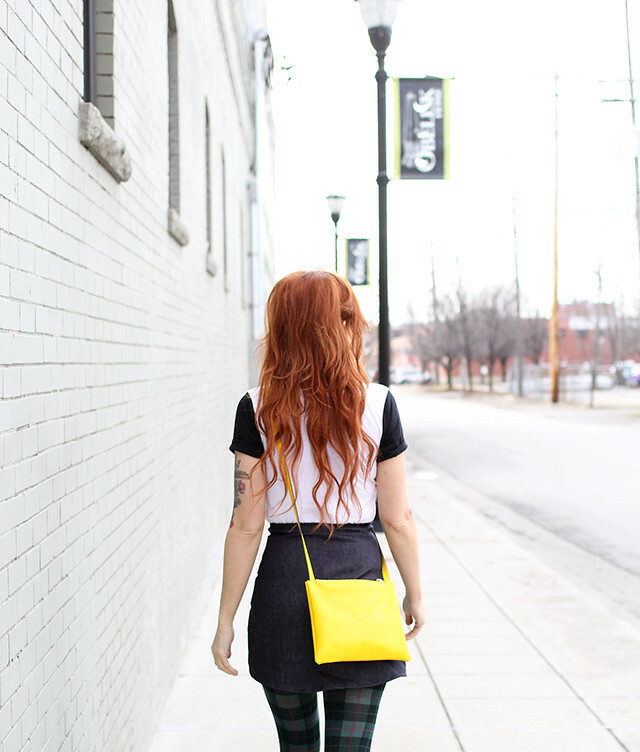 Big, chunky buttons are a huge favorite of mine and you dressed it so well! And hey, hopes up for spring! It's here! I find it incredibly exciting that it's warm enough to wear short sleeves! Spring has finally sprung!! Adorable! 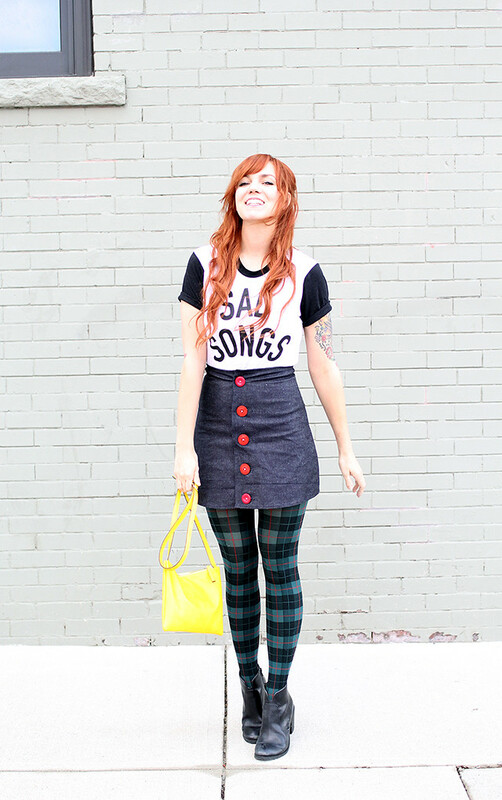 I'm loving how the plaid tights add such a chicness to this look! Also, you did a great job with that skirt! I'm picturing it in a purple with white buttons for some reason too!